Part of my commute takes me through a neighborhood that's a bit run down (those buildings in the background are housing projects, but the neighborhood isn't really all that dangerous). One of the truly baffling parts of my world is this red "Hulk Hogan's Pastamania" awning, attached to the side of a building. There's not even a window under it. Huh? 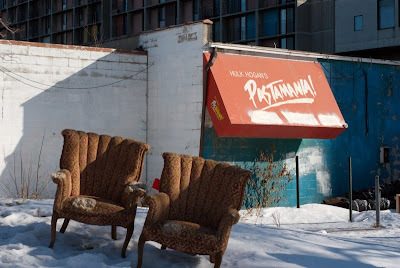 I did a little Googling in preparation for this post, and it turns out that Hulk Hogan's Pastamania was an insane business venture by Mr. Hogan (yes, the wrestler) -- canned pasta, and a restaurant at the Mall of America. I assume that this awning came from that restaurant... but God knows why it's attached to this empty wall. There's strange activity afoot at this building. 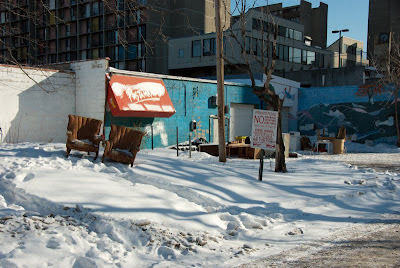 The city came by and disconnected the gas and (I think) water, and then tons of furniture and other junk appeared in the snow in front of it. There's workmen here and there. I wonder if they're going to tear it down? I might try again on this shot. I thought the snow on the awning would add interest, but I think it actually just makes it hard to read. It actually fell off between my trip in and my trip out a few hours later, but I didn't take any more photos (doh).